Once you are able to master the basics of making DIY earrings with beads, the possibilities really are endless! Handmade earrings make ideal gifts, can be made to match any outfit, and are inexpensive and fun to make. In this guide I’ll teach you how to get started with a basic pair of beaded earrings. 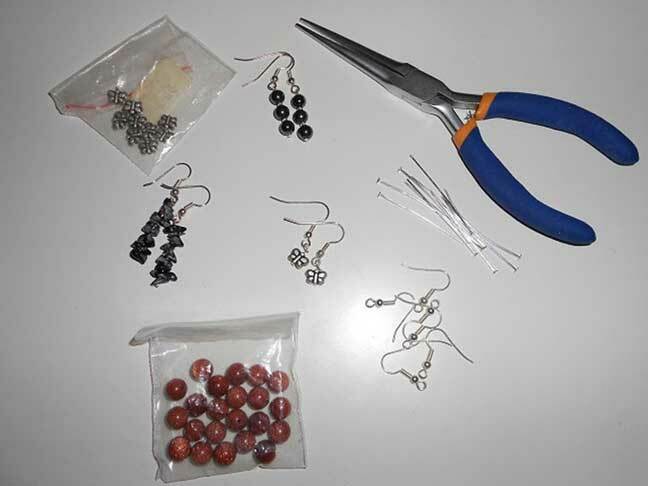 Some examples of completed earrings and the items you will need are shown in the picture above. Everything you see in the picture is easy to source from a craft or beading shop, or online. Take a headpin and thread onto it the beads you have chosen, as shown below. 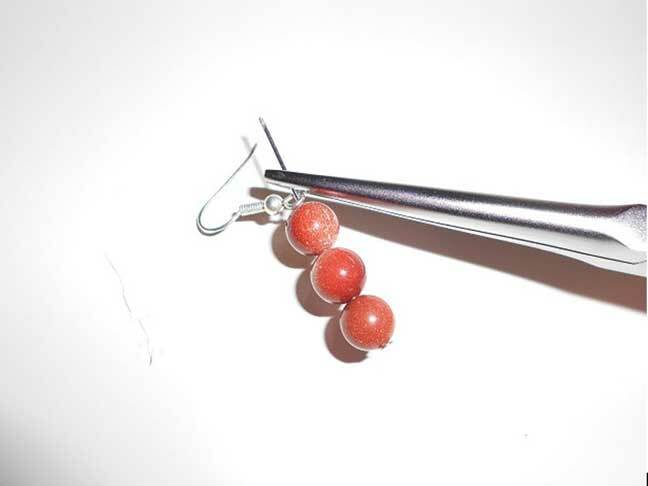 In this picture I have used three Goldstone beads, but there are many different gemstone beads you can choose from, in all sorts of shapes and sizes. The other item shown in the picture is the hook (or ear wire), which is going to be attached to the headpin. As in the next picture, simply pass the headpin through the loop on the hook. Using needle nose pliers, carefully twist the wire from the headpin to form another loop (as shown below), so that it closes around the first loop. It doesn’t matter if this is messy as you can use the pliers to straighten your loop out, just take it slowly. Next, nip off the end of the headpin after the loop using wire cutting scissors (or small craft scissors) and using your pliers just manipulate the loop so that there are no sharp edges and it is neat. Your earring is now complete! You might find it easier to twist the wire of the headpin into a loop and then add the hook before closing the loop and cutting it off. Experiment with this and do what feels easiest for you. Personally I add the hook and then make the new loop but I know a lot of people prefer to make a good loop first, then add the hook. I would recommend you try it both ways. 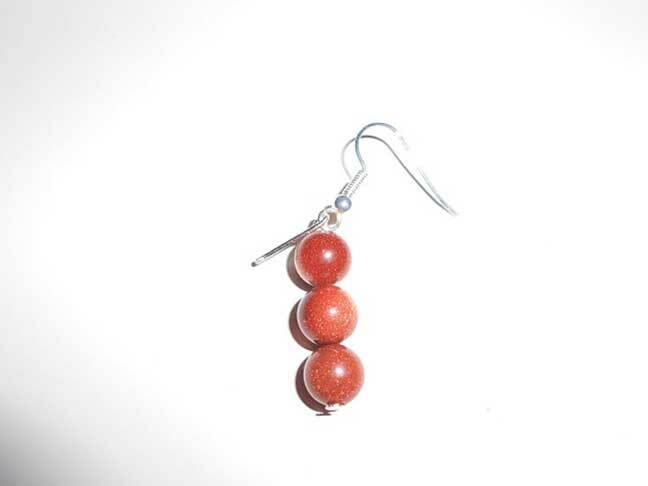 Once you are happy with the basics of making earrings, I suggest trying beads of different colours, textures and stones, finding the combinations you like. 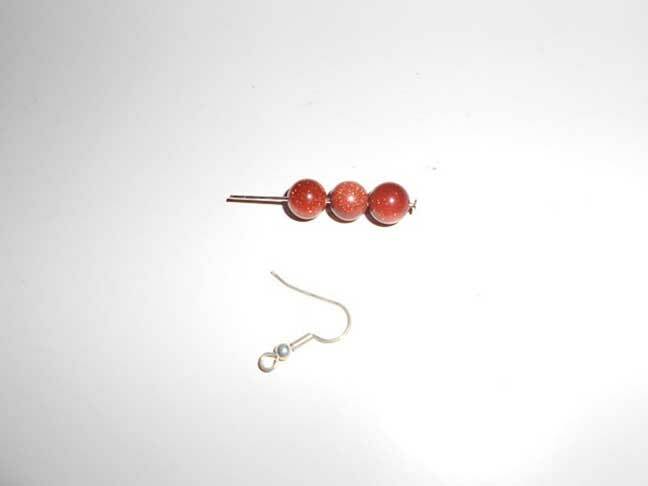 You can also buy headpins that end with a loop at the bottom instead of a flat base (these are called eyepins), and you can then open that bottom loop to add a charm on the bottom of the earrings for a different look. For very simple earrings you could even choose two small pendants or charms and attach these straight onto a hook without needing a headpin. Once you get started it really is something you’ll enjoy doing time and time again.